I purchased the Platinum 3776 Century as part of an order from Amazon Japan late last year. My original aim to the order was to buy a Pilot Custom Heritage 91 with a soft fine nib (review coming soon), I threw this into the checkout basket because of its relatively low price. Plus I have heard many good reviews about the Platinum 3776 Century so I had to check it out for myself. I have opted to get it in a Chartres Blue which is in my opionion the best looking option there is. I went for the medium nib because of my experience with their fine nib with the Platinum Balance. You might be wondering what does the 3776 in the name refers to. It refers to the height of Mt. Fuji in metres. I like that little call upon the Japanese heritage of the pen. 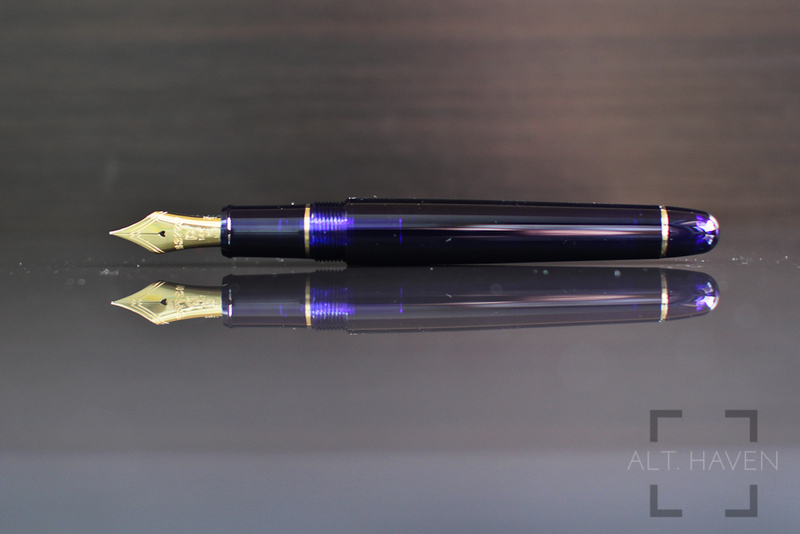 The Platinum 3776 Century comes in a blue clamshell case. The clamshell case is pretty standard and nothing too special. The pen is nestled gently among the white satin-like material. It comes with a single Platinum blue cartridge and the usual user manual and warranty card. I must say I am surprised that for a pen of this price that it doesn't just come with a converter. 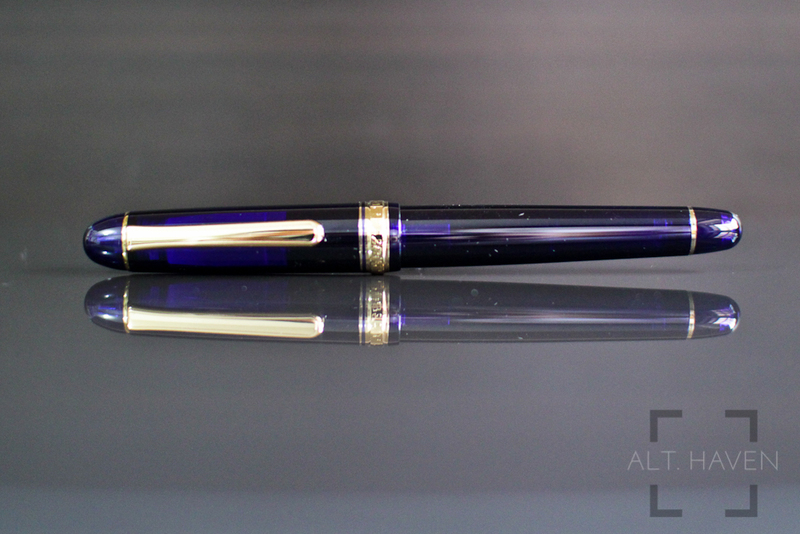 The Chartres Blue version of the Platinum 3776 Century is a cigar shaped pen with a dark blue almost purplish see through resin barrel with gold accents. 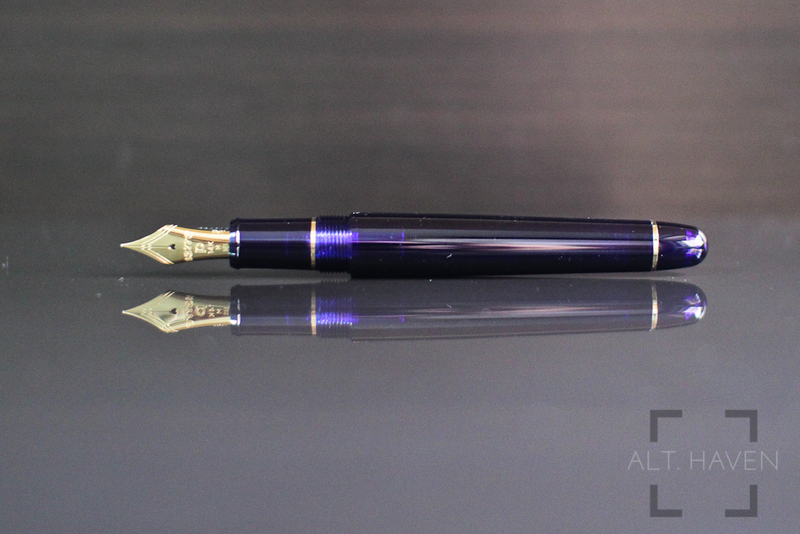 Although I personally prefer silver accents for most of my pens, I must say this colour combination is just divine. I love its understated design but it is a pretty standard look for most Japanese pens. The clip is simple but stiff as hell. I would expect that for most purposes the clip would require a two hand operation. Accross the centre band, the words "#3776 Platinum Made in Japan" are engraved into it. Other than that there are no branding on the exterior of the pen. The cap comes off by simply unscrewing it. The Platinum 3776 Century comes with Platinum's slip and seal mechanism. It is marketed as being able to keep the ink from drying up inside the pen for up to 2 years. Now I have not been able to test this since I doubt I would ever leave ink inside a pen for 2 years and not noticed but in case this happens to anyone it's a technology that's there for you. The cap posts securely on the end of the barrel though I am worried the inner threads of the cap would scratch up the body given enough time. 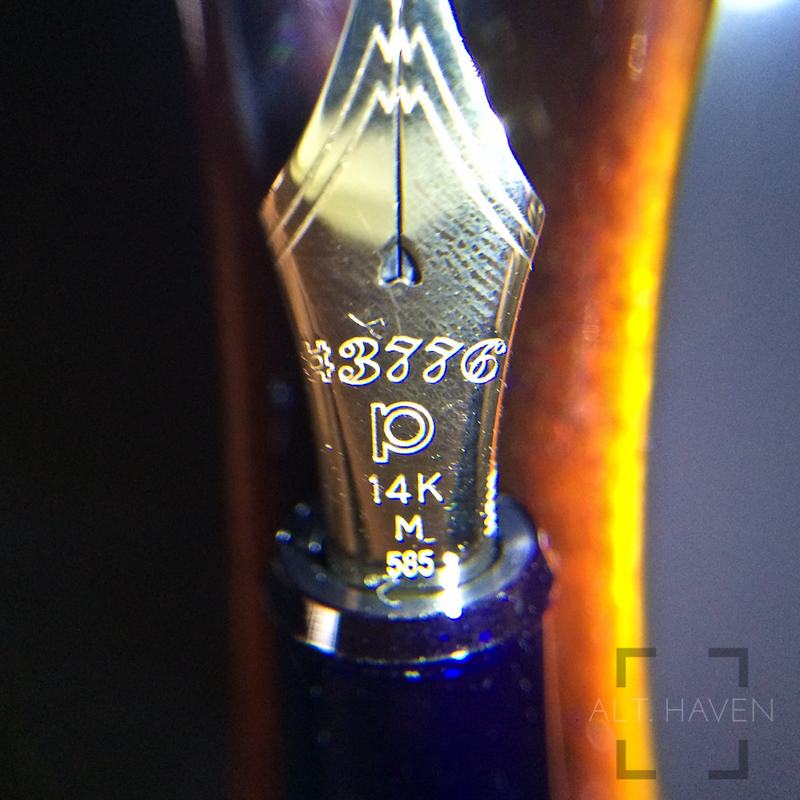 The Platinum 3776 Century nib is one beautiful nib. 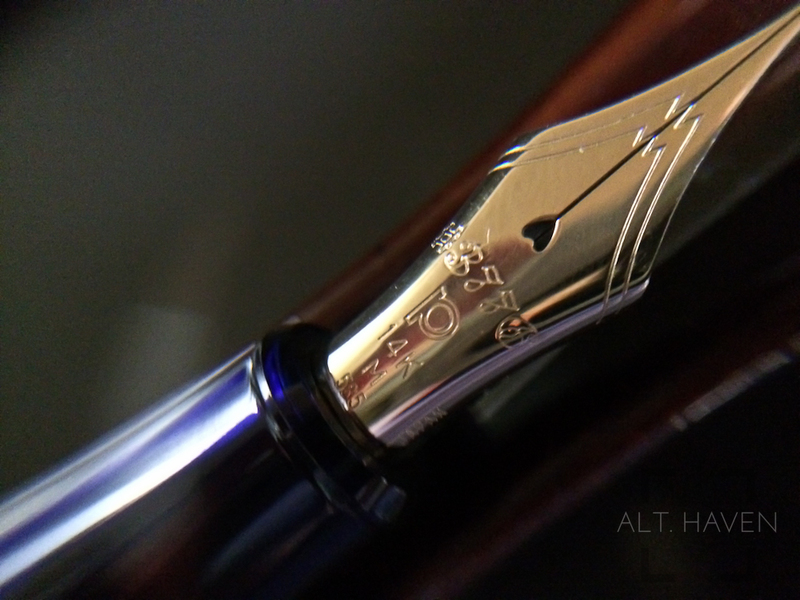 The nib is a 14k gold nib to match the gold accents of the pen. The pen takes Platinum proprietary cartridges and converter. Sadly there is metal inside the barrel so an eyedropper conversion for this pen is out of the question. Regardless, the Platinum 3776 Century with its cartridge and converter filling system makes it easy to clean and mantain. The step from the barrel to the grip section is gentle and the threads doesn't cut the finger. 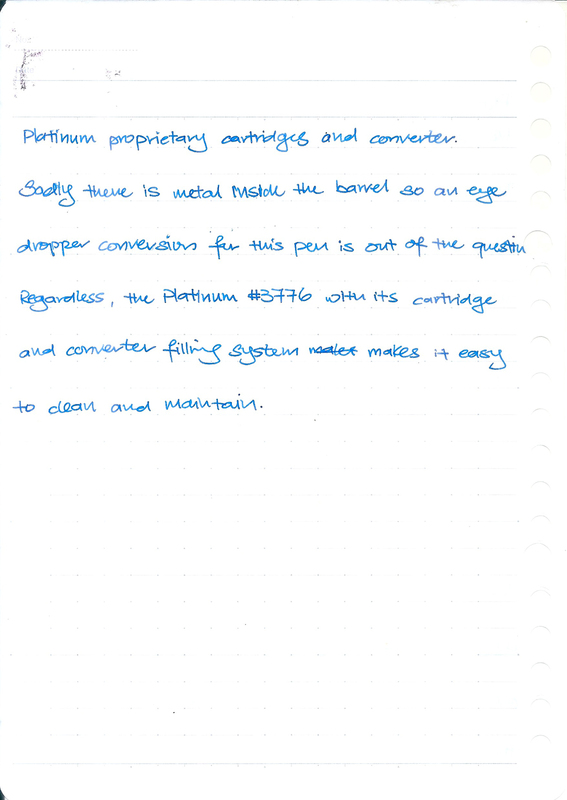 The Platinum 3776 Century is light but it is well balanced with the weight falling towards the nib. The size and weight of the Platinum 3776 Century is just perfect for me. The 14k gold medium nib performs prefectly for me. This isn't a springy gold nib it is relatively stiff though if you are willing to push it you can get very minimal line variation out of it. The medium is smooth and a dream to write with. It is a far cry when compared to the Platinum Balance that I have used previously. The breather hole is in a little heart shape a departure from the regular circle that is the norm for most other pens. I must say the Platinum 3776 Century really surprised me. I didn't expect to like the pen as much as I am loving it. 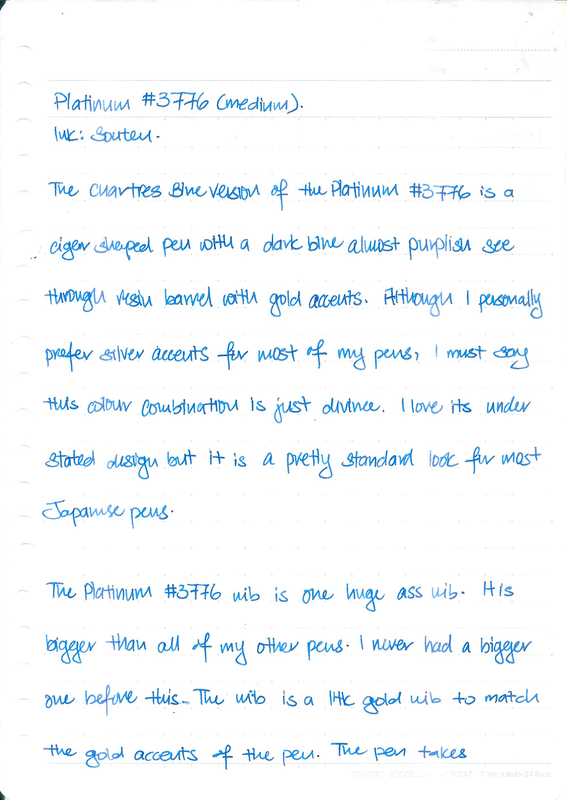 The Platinum 3776 Century will be defnitely be making an appearence in my Top 5 fountain pens for 2015!